CK Special Gases disposable non-refillable cylinders are typically used for function testing of gas detection and analytical equipment where portability is paramount or gas usage is relatively low. Many mixtures, including all the common quad gas variants, are available from CK Special Gases within 7 working days and bespoke mixtures can be supplied with minimum lead time. CK Special Gases always aims to give you the best technical solution to your needs. 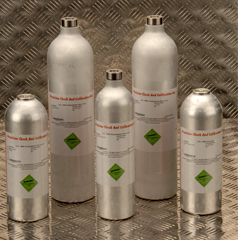 Our calibration gas mixtures and high purity gas range can be provided in non-refillable cylinders as an alternative to refillable cylinders. For low or sporadic usage – often research or educational establishment only need gas for specific experiments. Non-refillable cylinders provide a cost-effective solution that avoids the ongoing rental charges associated with refillable cylinders. Where portability and ease of use is paramount – non-refillable cylinders are exceptionally portable and ideal for on-site calibration of gas detectors. Their simple operation enables use by a wide range of plant operators for function testing of portable detection equipment. With a range of non-refillable cylinders extending from 12 litre gas capacity to the market-leading 110 litre cylinder, easy to use specialist gas control equipment plus extensive stocks of common gas detection mixtures, CK Special Gases can provide you with a full solution to your needs.